Knowledge isn’t measured by how much one remembers, but by how much an individual is able to recall when needed. Such “measurement” might be accomplished via a test in school or completing a particular task at work. And while the brain is programmed to efficiently and effectively store information in memory, it often needs assistance retrieving information from memory for useful, real-life application. For example, try to recite the lyrics from a favorite song without listening to the music. Then, play the melody (i.e., the music associated with the song but without the lyrics) and try to recite the lyrics. You will most likely be able to recite many more of the lyrics of that particular song with the aid of the melody (music) than without the melody. That is because your brain has stored the information related to that song in an associative matrix that includes both the music and the lyrics together. Therefore, it is much easier for you to remember and recite those lyrics within that associative framework (music + lyrics) than separately (lyrics only). The difference between the storage and retrieval abilities of the human brain is most likely evolutionary. Events of highest priority, such as the details associated with a life or death situation, will generally have high storage and recall potential. That is why it is so difficult to willingly forget the causative events associated with post-traumatic stress disorder. Obviously, for learning, we do not want to resort to such drastic measures to aid in the storage and recall process. Therefore, it behooves us to understand how the brain stores and retrieves information, and how to optimize learning relative to those storage and retrieval processes. Leading research in the fields of neurobiology and cognitive psychology have demonstrated how memory is formed and how memory can be strengthened to allow for greater recall when it counts – on exams, on the job and in real-world situations. That research has demonstrated that to be truly effective in increasing long-term retention, learners should be offered the opportunity to practice both the storage and retrieval of knowledge. In this paper, we begin by outlining the molecular processes of memory formation, and what makes some memories stronger than others. We will then summarize cognitive psychology research that demonstrates the role of retrieval in boosting memory strength. Finally, we will discuss how to pragmatically implement these findings within the learning environment so that long-term retention is optimized. Nobel Prize-winning research in neurobiology has shown that long-term memory is formed through a process called long-term potentiation. In each neuron, there is a control system responsible for repressing or activating genes depending on signals received from the senses. External signals emanate from the environment and enter the brain via the sensory inputs of sight, sound, touch, taste, or smell. This begins a cascade of processes, resulting in the synthesis of select proteins in neurons, which in turn increase the strength of synaptic connections between neurons. Thus begins the process of long-term potentiation. Synaptic strength can be further increased by repetition of the same inputs or stimuli associated with the event, by increasing the intensity of the stimuli associated with that event, or through repeated retrieval of the memories associated with that event. Repetition – When a stimulus is repeated frequently, the repressor threshold is overcome and synaptic strength increases. Emotion – Emotion is a form of salience, and acts as causal driver of synapse formation. Emotionally vivid events create a flood of neurotransmitters, like serotonin and glutamate, which overcome naturally occurring inhibitors found in neurons. These transmitter molecules switch on the genes that activate synaptic growth and strengthening – the building blocks of long-term memory. Stimulus Intensity – Also related to salience, the intensity of an event can markedly increase the synaptic strength of neurons associated with that event. These factors come in to play at the time of encoding. Unfortunately, in the learning environment, these synaptic-strengtheners are often not controlled by learners. For example, a learner generally has no control as to whether learning content will illicit an emotional response in his or her brain, or will be sufficiently salient to increase attention to a point where long-term memory is positively impacted. Without these strong connections established at the point of encoding, how is a learner expected to be able to recall the information easily? Research in the field of cognitive psychology has demonstrated one way – practiced retrieval. Scientific research has shown that one way to strengthen synaptic connections, outside of an initial encoding event, is to practice memory retrieval. Research in the field of cognitive psychology demonstrates that the more a memory is actively recalled, the stronger its memory trace becomes. Think of a memory trace as the neurological pathway created by the network of neurons and synapses that comprise a memory. The more often a memory is recalled – or retrieved – the more worn and engrained the neurological pathway becomes in the brain. One of the best examples of practicing retrieval is The Testing Effect as demonstrated in learning environments. Up to this point, we have seen how a memory is first encoded in neurons, then stored in synaptic patterns, and later retrieved. We have also discussed how repeated memory retrieval strengthens the original memory trace and improves the ability to recall a memory. Now we will turn to the pragmatic application of these scientific findings in the learning environment. Study: The passage was read four times with no testing as part of the memorization. Single test: The passage was read three times and memory was tested once. Repeated test: The passage was read just once, and memory was tested on three occasions at varying intervals of time. When the final test of memory was performed five minutes after the students completed the memorization exercises, all three methods proved effective. However, when retention rates between treatment groups were tested one week later, the positive impact of testing on retention became clear. 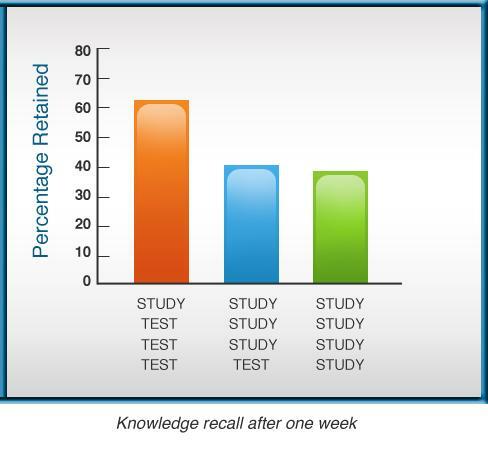 As illustrated in the chart to the right, the repeated test method was far more effective at 62% retention, while the repeated study method came in at 39% retention. Students who studied by actively retrieving the learning content in a test-like scenario, instead of passively reading the learning content, were almost twice as likely to be able to remember and recall the information. The act of repeatedly retrieving – or recalling – the information from memory, strengthened the memory trace and allowed for increased ability to recall the information over time. Practicing recall begets greater recall. Similar results have been observed in many other studies (e.g., Pashler, Cepeda, Wixted and Rohrer, 2005; Karpicke and Blunt, 2011). When learners are subjected to testing (assessments) as part of their learning, their brains are forced to create associations between the new information and knowledge already stored in memory – a process called elaboration. When learners’ brains create these types of associations between items, they are also strengthening the process required to retrieve those items. Testing provides practice in activating these retrieval pathways, whereas use of reading as a sole practice for studying does not. Knowledge Factor’s amplifire learning software puts these research findings into practice. In fact, retrieval through testing is one of the 22 scientifically-based learning and memory triggers that are incorporated into amplifire’s accelerated memory protocol for learning. The amplifire learning software employs an adaptive algorithm that iteratively loops students through learning content until mastery is achieved. Formative assessments are an integral component of amplifire-based learning. Students cycle through a personalized, adaptive process of test, learn, and re-test until they answer each question confidently and correctly twice in a row. This repetitive process boosts protein synthesis and long-term memory formation in learners. As learners iterate through modules, they encounter questions they have already responded to in previous cycles, as well as questions they have not yet seen. The repeated questions, and the learning associated with each, will have also already been reviewed in the learning center. The learners are asked to retrieve the information from memory to answer the question anew.